Funny and cute maternity T-shirts for the expecting mother. Our rhinestone maternity shirts are available for any phase of your pregnancy. Our unique maternity shirts are made with a generous front panel to fit from mid- to full term. 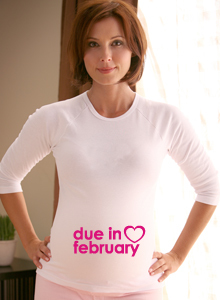 Choose a funny maternity shirt, or something that communicates a special message. Give fair warning - you have precious cargo in your belly! Your body is cooking up a great little baby - be patient. Does This Shirt Make Me Look Fat? T-shirt. Tongue in cheek humor for your pregnancy. For your special child, may the force always be with them. You have to have a good sense of humor to wear this design. Funny Maternity Shirt will give them all a good laugh. Computer geeks will appreciate this funny maternity shirt with computer loading bar. You are going to see your relatives and need a fun way to tell them that you are due. 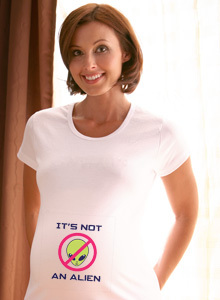 A cute or funny maternity T-shirt can deliver the message. You can go with a humorous design, like Preggo or Knocked Up, or an informative approach, like It's A Boy. If you are feeling creative you can even come up with your own custom maternity shirt design.